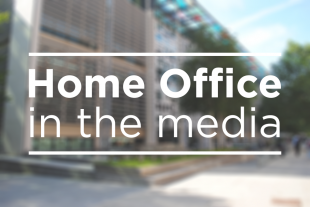 Today's Home Office stories include no-deal security, claims of cheating on citizenship tests, and the cost of Donald Trump's visit to the UK. There is widespread coverage of the Home Secretary’s appearance on the Andrew Marr programme yesterday, with one of the main focuses on his failure to deny that the UK would be less safe under a no-deal Brexit. The Independent reports that he admitted there would be a change in the UK’s security capabilities. The BBC’s Andrew Marr asked the Home Secretary about the comment of the former national security advisor Lord Rickets who has previously said a no-deal Brexit would be a “really serious and immediate problem for British national security”. The Home Secretary responded by admitting it is “absolutely true” that “certain capabilities” will change under a no-deal. He added though that he was “absolutely confident” that we will would continue to be one of the safest countries in the world, even in a no-deal scenario”. The UK is unconditionally committed to Europe’s security now and after our withdrawal from the EU - the continued safety of all citizens remains our top priority. “The Government’s position remains that the agreement reached with the EU, which includes ambitious internal security arrangements that maintain operational capabilities at current levels as far as possible, is in the UK’s best interests. “However, we are working intensively with operational partners to put no deal plans into action to ensure we can continue to tackle fast-evolving threats. These plans include moving to tried and tested alternative mechanisms already used for security co-operation with many non-EU countries. The Daily Mail reports that immigrants are paying fixers to help them cheat in the Life in the UK citizenship test. The paper says that undercover footage, revealed by BBC London News, shows how “lax security lets criminals feed their customers the rights answers via tiny earpieces”. The paper reports that in the programme, which will be broadcast tonight, an undercover reporter meets with Abdul Reza Masud, director of the Ideal Learning Academy in East London, who charges the reporter £2,000 to help him cheat. The paper says the reporter is given an earpiece to take with him to the exam and isn’t searched before he sits the test. We take any form of cheating during the Life in the UK test extremely seriously. “Instances of attempted cheating are exceptionally rare and Life in the UK test centres are required to put in place stringent measures, including CCTV recordings, candidate searches to ensure no electronic devices enter the test room, ID checks and pixelated screens, to ensure it does not happen. In addition we have a robust audit system, including unannounced visits to test centres. “Where we have evidence that a test centre is failing to uphold our standards, we will investigate and take appropriate action. The cost of US President Donald Trump’s visit to the UK is covered in the Sun, Express and Independent. The Express reports that Donald Trump’s four-day visit last year cost the police and therefore tax-payers, more than £14.2 million because of the thousands of officers drafted in from every force. The Independent reports that the Home Office reimbursed £7.9 million to cover the additional costs to the three forces in England that “hosted” the President, and that the Treasury was to refund Police Scotland. The Sun highlights that the police bill was estimated at £10 million before the visit took place. We received applications from three forces for Special Grant totalling £7.9 million in relation to their additional costs arising from the US President’s visit. These claims have been paid in full.